September, we’re coming in hot!!! Damn, I know I can speak for a lot of folks when I say this year seems relentless with the heat. It may be September but we’re experiencing triple digit numbers yet again. The air quality has been terrible due to forest fires and being outside is just the pits. Luckily, the summer bounty is thriving and I’ve got the perfect soup to serve on a hot September evening. 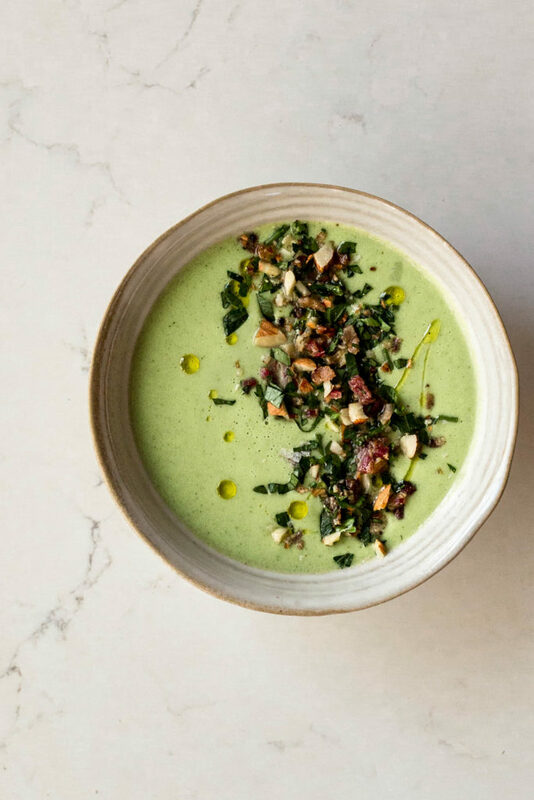 This chilled cucumber soup is creamy, refreshing and the bacon gremolata takes it over the top. In fact, the bacon gremolata is a recipe from my cookbook and it’s so versitle that it’s in my cookbook twice– sprinkled on a collard green slaw and then again on roasted cabbage wedges. You really can’t go wrong with this topping! You’ll find yourself sprinkling this on everything from soups and salads to avocado toast and roasted veggies. Aside from turning on the stovetop to fry the bacon you really don’t have to heat up your kitchen. And hey, heating up the kitchen just for a hot second to fry bacon isn’t half bad. You can also fry your bacon in a cast iron pan on the outdoor grill too (which is my trick in this heat.) Regardless of which method you choose I hope you all enjoy this soup as much as we do. Serve it alongside a simple green salad and Viola! Dinner is served. Fry the bacon in a large skillet until crispy. Remove from the heat and transfer to a paper towel lined plate. When cool enough to handle chop into small pieces. Place the almonds in a small food processor and process until they are finely chopped, being careful not to over process into a nut butter--you want a little texture here. In a bowl toss the bacon, almonds, minced parsley and lemon zest together. In a blender combine the cucumber, yogurt, lemon juice, garlic, dill, parsley, ice cubes and olive oil. Blend until smooth. Divide the soup between bowls and top with the bacon germolata. Yum! This sounds perfect for our hot, hot summer. I’ve been thinking of you and Taylor out in the fields in this stinkin’ heat. Wishing you cooler temps and clear skies soon–thank you for your blog and your bee-yootiful cookbook. This cucumber soup sounds delicious with the dill, and the parsley in the gremolata 🙂 Vegetarian here so may be toasted coconut slices chopped up instead of bacon! Love the idea of your veggie version. Maybe toast the coconut with a little smoked paprika for a sweet/savory flavor. Let me know how it turns out!